If you are living with dementia or know someone else who is, you can show your support for them by registering for the IG Wealth Management Walk for Alzheimer’s. The fundraiser in support of the Alzheimer Society of B.C. takes place at the Gardner Park at noon on Sunday, May 5. The event provides an opportunity to remember or honour people who have been touched by dementia, while fundraising to support those living with the disease today. Each of the 21 events across B.C. is dedicated to an honouree – an individual or group affected by dementia, or who has valuably contributed to the lives of people living with the disease. This year the Abbotsford Walk honours Tom and Samantha Smith. Tom, a friendly and happy-go-lucky guy with a lifelong love of singing, was diagnosed with Alzheimer’s disease four years ago. 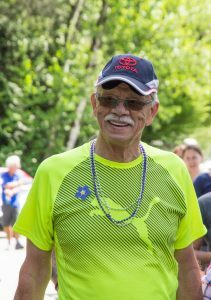 His daughter Samantha began noticing his forgetfulness and soon the duo were accessing a variety of Alzheimer Society of B.C. support and education services together. They continue to attend Minds in Motion®, a social and fitness program for people in the early stages of dementia and a care partner. “We’ve been able to connect with other families. It’s been wonderful to be with other people who understand what we’re going through,” Samantha says. Funds raised at the IG Wealth Management Walk for Alzheimer’s help enable Alzheimer Society of B.C. support and education in Abbotsford and help facilitate research into the causes of and the cure for the disease, so we can look towards a world without dementia. To double your impact and support people, like Tom and Samantha Smith, who are on the dementia journey, register at walkforalzheimers.ca today.